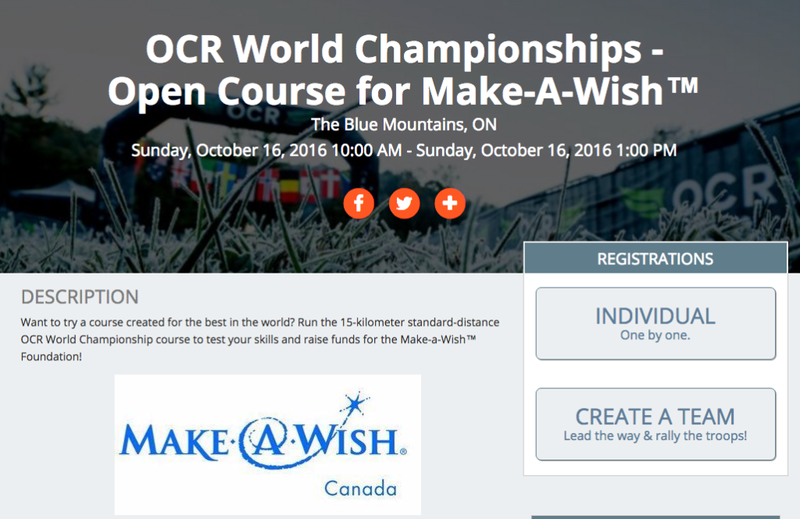 OCR World Championships continues to up the ante this year with its latest partnership with the Make-A-Wish Foundation Canada. Since the beginning, the OCR World Championships have been committed to giving back to the community and this partnership continues that mission with a special charity run on Sunday to benefit Make-A-Wish Canada. In addition to all the other offerings on OCRWC weekend, this event allows anyone to attempt the 15K World Championship course without the pressure of timing or mandatory obstacle completion. This is meant to be a fun run open to all abilities and a way for families to run the course today and raise money for a great cause. Unique shirts and medals will be given to participants and no qualification is required. Mud Run Guide spoke with Adrian Bijanada, founder of OCR World Championships this morning in anticipation of the announcement. With this partnership comes a sense of completion as it brings the OCRWC just a few steps away from being where we want it to be. It's a great way for us to to further leverage our course, our team's passion and hard-work, and our existing partnerships, all in support of a great cause. Participants are encouraged to run either as individuals or form teams and run together. OCR World Championships continues to be a leader worldwide in the progression of obstacle course racing and this newest offering continues this progression. For more information visit the OCR World Championships website or the Event.com page for the event to signup. This is an awesome event!! Will you have one in Indiana? ?